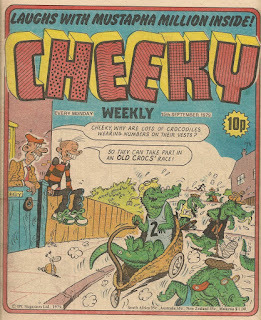 Cheeky and his dad indulge in reptilian repartee on the cover of issue number 97 (a glimpse into Crystal Belle's crystal ball would have revealed that only 20 more issues of the toothy funster's comic would roll off the presses). Cheeky's name is on the gate - whether it's a welcome or a warning that the house is our grinning pal's place of residence is open to speculation. Readers of this earlier post will be aware that while preparing this issue summary I realised that some of the artwork in the edition under review which I had previously attributed to Mike Lacey was actually by Jimmy Hansen. 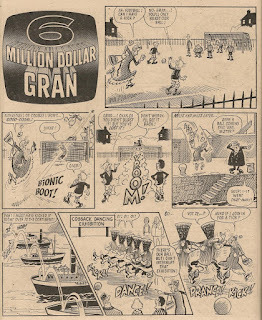 Just prior to putting this post to bed I also decided to change the artwork credit on the cover pic from pure Frank McDiarmid to Frank McDiarmid pencils. This is the final time that the Frank/inker collaboration furnished a 'cover feature' (which is my term for anything on the front page that's not a comic strip). 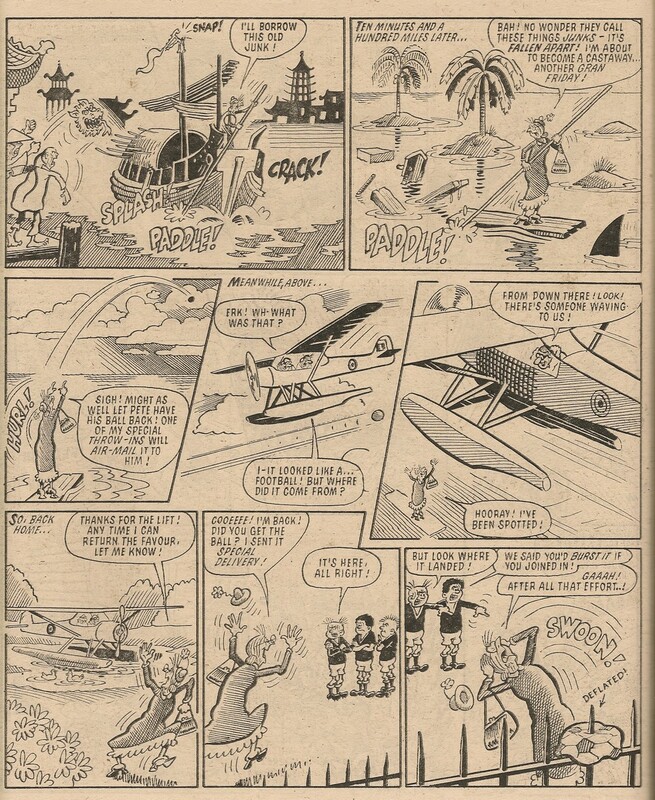 Jimmy Hansen depicts Cheeky's usual Sunday paper round, which takes our grinning pal once again to Krazy Town harbour, a geographical feature that didn't appear on the aerial view of the toothy funster's locale printed in the first issue of Krazy. 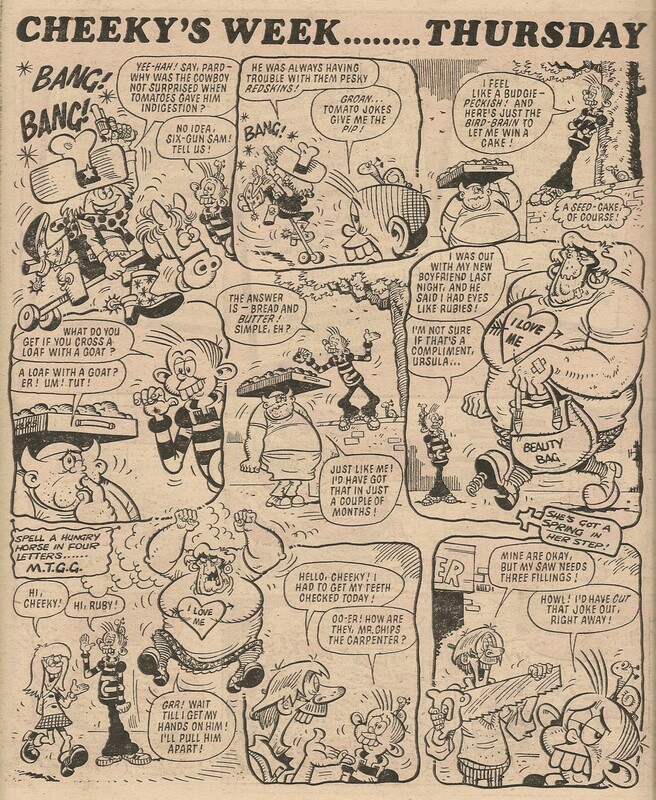 But the highlight of this page is surely our glimpse of Constable Chuckle's night attire. Charlie Counter is invited to a party this week (a further consultation with Crystal would have revealed that Charlie and Calc would be attending the same celebrations, albeit with a gatecrasher who wasn't present the first time round, in Whizzer and Chips on almost exactly the same date 6 years later). 6 Million Dollar Gran's robotic rocket shot (inaccurately billed as a Bionic Boot) initiates a globe-spanning search for the missing football. 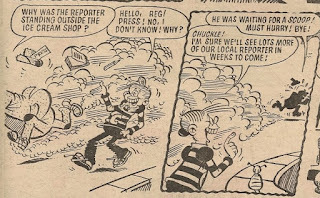 On Wednesday cheeky encounters a new character – the newspaper reporter named Reg Press (who in all his subsequent appearances was called Rex Press). 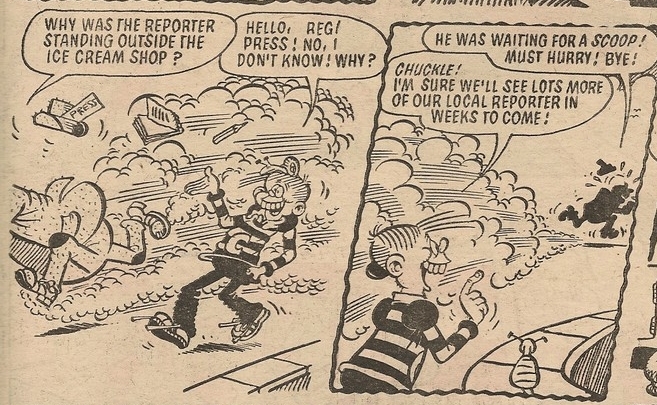 Not quite sure what that stroke in Cheeky's speech bubble to the right of Reg's first name is supposed to represent (possibly an indication there was some uncertainty as to the humorous hack's monicker? - the fact that Reg/Rex's face isn't shown could suggest that the character's visuals hadn't been decided upon at this point). 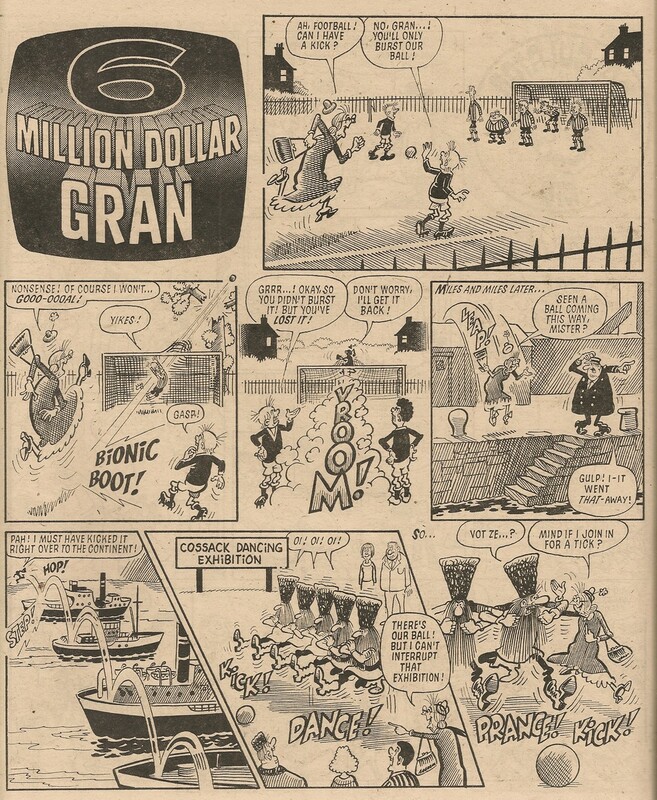 Thursday sees the Cheeky's Week artwork duties handed over to Mike Lacey (see here), and a couple of pages later Barrat's Oran-gee-tang bar ad makes its debut. 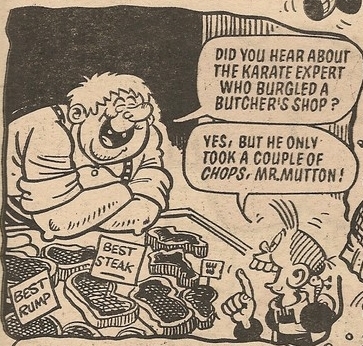 Also making a first appearance, this time on Friday, is Krazy Town's merry meat merchant, Mr Mutton. 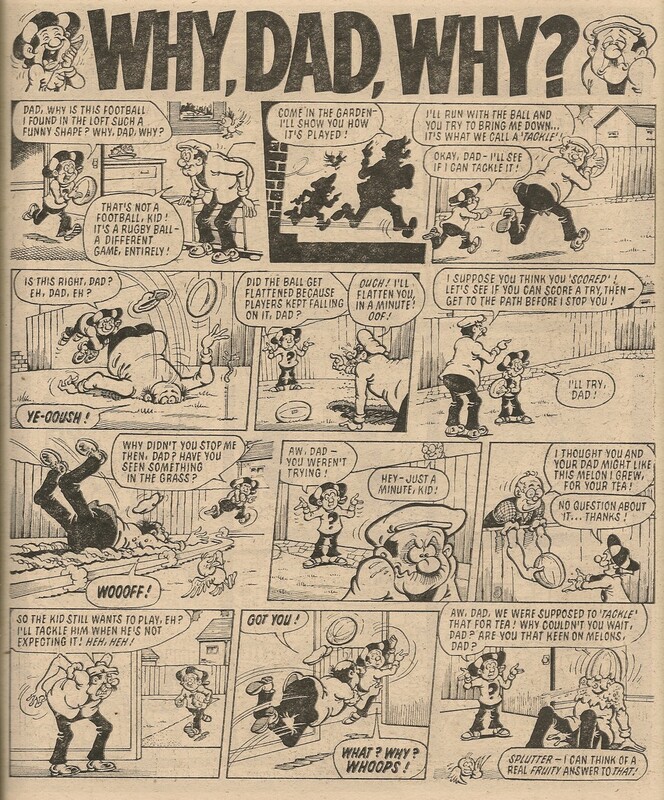 Like 6 Million Dollar Gran, the father and son stars of Why, Dad, Why? are beset by ball botheration. 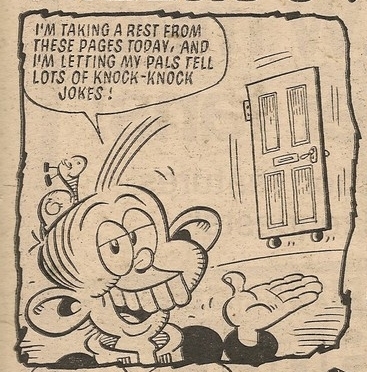 Lest any readers cancel their regular order for the comic in the belief that our toothy pal has quit the comedy business for good, Cheeky returns at the end of the Saturday 2-pager with a promise that he'll be back next week. Exit, pursued by Knock-Knock Door. 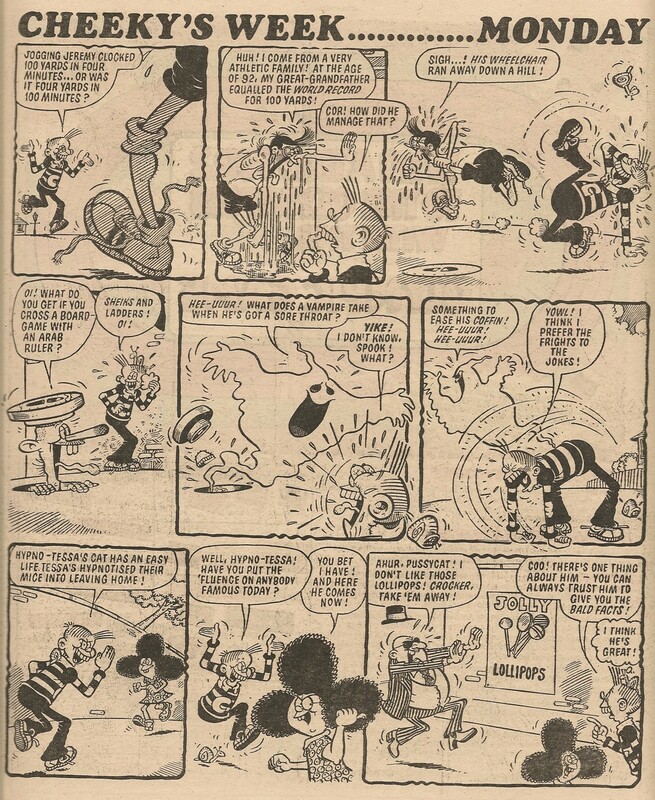 Cheeky's farewell is a little premature, as he is seen again on the back cover's Snail of the Century, which is Frank McDiarmid's only pure work in this issue. The Mike Lacey and Jimmy Hansen Crisis! Part 6 - Resolution! Following my previous post, I have completed my re-evaluation of all the artwork that I previously attributed to Mike Lacey. This was an interesting project as my realisation that the work displayed in the link above wasn't Mike's enabled me to look at artwork that I have studied many times before in a new light. As a result the artwork credits associated with 130 Cheeky Weekly elements have been changed. The question of course is, if these elements were not drawn by Mike Lacey, who was the artist? 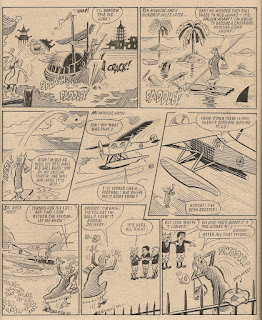 As discussed earlier in this series, the similarity of Jimmy Hansen's style on The Bumpkin Billionaires in the late 1980s to that of Mike's was what alerted me to the possible mis-attribution, and the very helpful comments from some readers of this blog also made it clear that the two artist's styles had been hard to distinguish for some time. Thus, my best guess is that Jimmy is the artist in question. There were 2 episodes of Speed Squad that always seemed to me to be by an artist other than the regular one (who I now believe to be Jimmy) although I couldn't identify who was responsible, and therefore they remained uncredited. 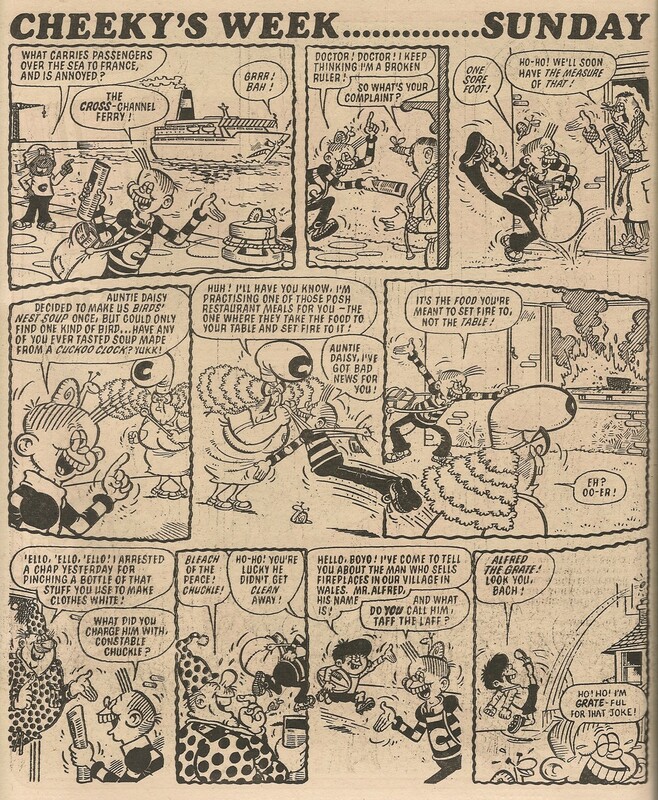 While studying these particular stories again, I came to the conclusion that the mystery artist is Colin Whittock, so I have updated these database entries as well. I have also tried to capture and update any sundry mentions of Mike, that I now believe to be Jimmy. What I haven't yet done is re-generate any of the tables in the affected issue summary posts, aside from the 2 indicated above (these were the first two issues in which Jimmy contributed to Cheeky's Week - I have yet to do a post about the third). Please accept my apologies for this. I've been aware for some time that I need to assign presently uncredited episodes of Creepy Sleepy Tale to Keith Reynolds, so I'll wait until I've done that before embarking on a mass update to the issue summary posts. UPDATE 17 November 2018 - I have now updated all the 'contents' tables in the issue summary posts covering Cheeky Weekly issues 1 to 96. This means that the contents now show Keith as the artist on the CST elements that he drew, and also Jimmy Hansen as the Skateboard Squad and Speed Squad artist for this run of comics. The summaries for issue 97 onward have shown the correct artist details for Speed Squad so they don't need amending. Labels: Jimmy Hansen, Mike Lacey, Mike Lacey or Jimmy Hansen? 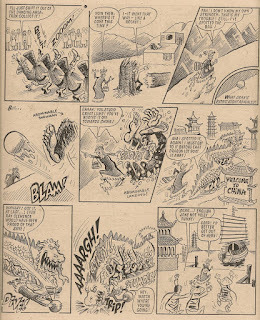 Since raising the thorny issue of the similarity of Mike Lacey and Jimmy Hansen's drawing styles I have been continuing my reading of the post-Whoopee-merge issues of Whizzer and Chips, to which both artists contributed, along the way trying to train my eye to recognise any peculiarities of illustration by which the two styles may be differentiated. 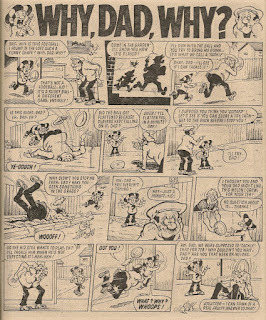 I have also done a bit of internet searching for any biographical detail about Jimmy, in the hope of discovering the date of his earliest published comic work, but sadly there seems to be practically no available information. Confusingly this site refers to him as Jim Hanson which doesn't help. 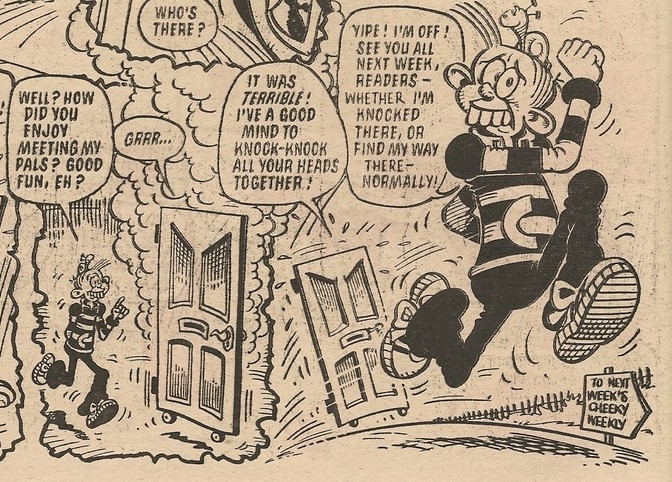 Anyway, back to the different art styles - I'd say Jimmy's character work often displays particularly exaggerated reactions, regularly veering into the grotesque, with Mike having a less extreme approach of depicting shock, fear, delight etc. which rarely extends to the ugly end of the spectrum (well, maybe a bit grotesque in the case of Ursula!). 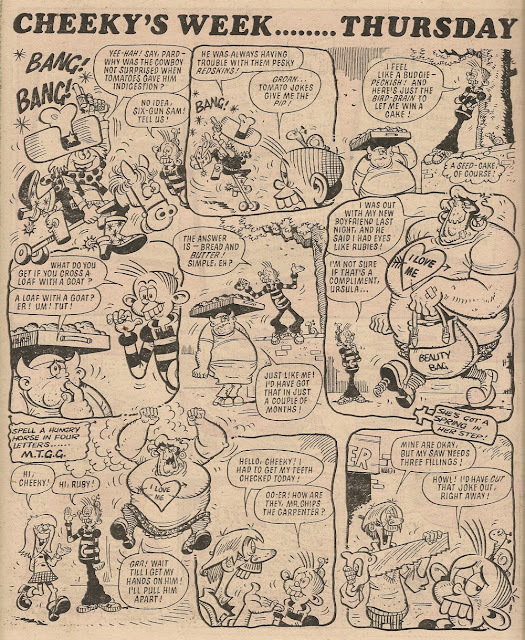 ...the depictions of Cheeky also differ quite considerably between the two pages. 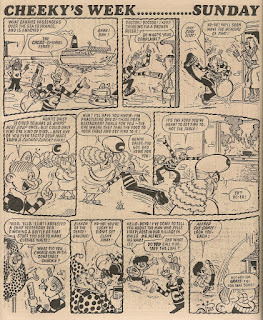 So, in the absence of any information as to Jimmy's earliest published work, I'm going to assign the Monday page above (and the other pages in the same issue exhibiting the same style) to Jimmy. I will at some point have to go through all the Cheeky Weekly work I have attributed to Mike and re-assess it based on the comparative styles above. It may be that the above is the first 'Jimmy' page that featured in Cheeky Weekly - won't know until that re-evaluation is complete. Labels: Mike Lacey or Jimmy Hansen?